Paul teaches us in 1st Corinthians and elsewhere, that true spiritual gifts come from God the Holy Spirit; that He gives us gifts according to His will and purpose (not ours) and that they are given to build up the Body of Christ (the Church) in love and service. Gifts are not to be a source of pride, boasting or division. In the Trinity 10 Epistle, St. Paul echoes his teaching elsewhere that the gift of tongues must be accompanied with interpretation. He also names here “discerning of spirits”. Elsewhere, discernment is held up with prophecy (speaking God’s message in plain language) and love as among the most valuable gifts. The Scriptures make clear that the Holy Spirit is a Divine Person of the Trinity, who exhibits truth, peace, unity and love – not confusion, division, self-centredness and deception. The Bible also makes clear (especially in St. Paul’s and St. John’s writings) that we must discern (distinguish) between the Spirit of Truth and false, wicked spirits. This is part of our common life in the Church, it’s not just about our own private, personal opinions. As Christians we must be loyal to the teaching of the Bible and the Church, and submit all our life and behaviour to Christ. A recent sermon (containing clearly false teaching) on the fortune-telling slave girl in Acts 16, sadly made by the Presiding Bishop of the Episcopal Church (USA). Both remind us of the importance of knowing the Bible’s teaching on these matters and to consult God and put our trust only in Him. 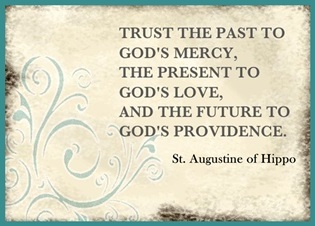 We must trust Him with our past (with our departed loved ones and our griefs) and our future. From Deuteronomy 18: 9-12 – Among the “abominable practices” of the pagan nations God drives out before Israel, that the Lord forbids his people to imitate are: burning their children as an offering (sacrifice to false gods); practicing divination or fortune-telling, interpreting omens, being a sorcerer (witch), charmer, medium, or necromancer [one who inquires of the dead]; “for whoever does these things is an abomination to the Lord”. Despite the fact that many such performers are frauds and charlatans using tricks and emotional manipulation, Christians cannot see such activities as harmless or mere ‘entertainment’! God forbids them because they are unhealthy, not good for us. They are “occult” (dark, hidden) practices. People can become obsessed with them. They can open doors to the whole unseen world of false and wicked spirits, even if we treat them as a ‘joke’ at the beginning. They also teach us not to put our whole trust in God but to seek false paths to knowledge of the departed or our future. In 1st Samuel 28 King Saul seeks a medium to call up the ghost of the Prophet Samuel. There is no suggestion that it did not ‘work’ – it seems to truly be Samuel. But, he is not happy about this unholy disturbance and it leaves Saul almost scared to death. It does him no good and much harm. In both texts, people are more concerned about loss of profit – the slave ‘owners’ with the loss of their fortune-telling ‘cash-cow’; the villagers (when the Legion enter the herd of pigs who drown) than with the healing of two possessed people! Profit and ‘entertainment’ still make a powerful, unhealthy recipe to lead people astray and enslave them! This passage (Acts 16) was, very sadly, turned completely inside out by the former Presiding Bishop of the American Church who perverted the plain meaning of the text. She sees the fortune-telling slave girl as someone who is simply expressing her ‘spiritual gifts’ in a valid way that is just different from Paul’s – not wrong. She further corrupts the text by suggesting that God allows Paul and Silas to be arrested -in the commotion stirred up by the slave ‘owners’ having their ‘property’ (the girl) de-valued and later released to ‘teach Paul a lesson’ that he should ‘affirm’ her ‘gift’ and not be so arrogant and intolerant. This denies the plain sense of the text that the girl was healed, delivered of demonic oppression – not ‘oppressed’ by Paul! We must seek discernment. We must let the very plain, straight-forward Word of God direct and rule our hearts and our lives. We can trust Him with our lives. We can trust Him with our past (along with its sorrow, hurts and griefs) and our departed loved ones. We can trust Him with our future.